I can FINALLY share with you all what has been causing myself and my family so much stress over the last few months, and what will continue to cause stress for a few more month, at least it finally looks like its all going to be worth it tho!! lol!! Be warned, this is going to be very long, but without the details it won't make much sense!! So.. it all started in October last year, when a house on 5 acres just out of town came on the market. We were really keen on the property, so made the decision to put our house on the market, to hopefully be able to buy the other. I had 1 week to pack up the majority of our stuff, as we were told to totally de-personalise it. The entire week that i was packing, i had a horrible flu, you know the type that would put a man in bed for at least a week, but i had no choice but to push on! I had to pack, and then scrub the house from ceiling to floor to have it ready for the agent to take photos and hold an open house the following weekend! Luckily we were able to pack all our stuff into Treens shed, saving us a LOT of money on storage!! So we put an offer on the place, and it was accepted, but unfortunately we didn't get any interest in our house, and it fell thru. The house then went under contract to somebody else before we could do anything else about it! So then we had to make a decision, would we keep our house on the market and hope something else comes up, or take it off??!! I was all for taking it off the market, as there was no way i was going to sell up and have no where to move to with two kids, but we tossed around a few ideas and decided we would keep it on til the agency contract was up in Dec and see what happened. Our agency agreement was set to expire on Dec 16th, and at that stage the place we were looking at hadn't settled yet, so there was still a slight chance we could get it, so we decided to sign up with another agency as well. With the two agencies signed up, we then started holding open houses just about every weekend, which was very draining on me, having to have it spotless every time, and the kids hated it cos they could barely play with any of their stuff for fear of making a mess when somebody wanted to come thru. 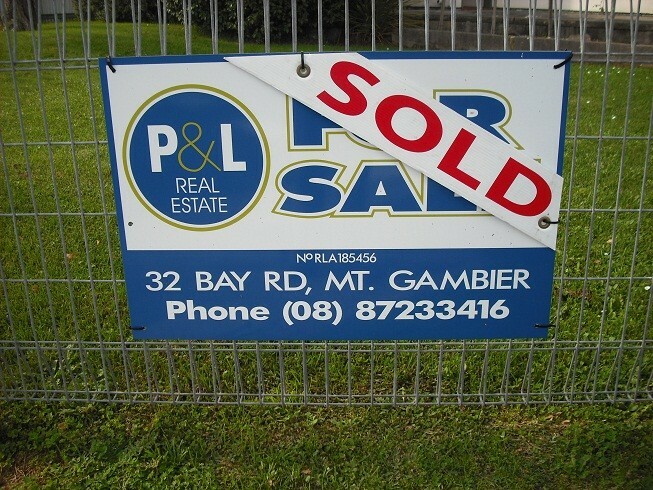 By the start of March, we had had a few people show interest, but they all had houses of their own that they had to sell, and by this time the house we liked had settled, so we then started talking about buying a block of land and building a new house on it if we could sell. Things still weren't looking great finding a buyer for our house tho, so we didn't look too seriously into it. And at this stage we also made the desicion to take our house off the market on March 16th when the agency agreements expired as we were totally over open houses and being pregnant wasn't helping things! However on the first weekend of March, we held an open house and we had a couple from Adelaide come thru. They spent an hour looking thru the house (the open was only meant to be 30mins), and by the time the left, i was home and actually spoke to them cos it was too hot to stay sitting in the car waiting for them to leave. lol! Three hours later they had put in an offer!! The offer was lower than we were asking, but was still within our range so we decided to accept it as there had been no other offers in 6mths!! The property market is barely moving down here, so we were happy to take what ever we could get!! As it turned out, the fella's parents live here, and they were looking for a house to buy and rent out for a few years before they move here, but had actually been down here to look at a different house. They didn't like it, saw our open house sign on the highway and decided to come for a look!! So now it was time to seriously look into what we were going to do next! We found some 5 acre blocks in Glencoe (30 kms from Mt G) and started looking at house plans and talking to builders. We settled on a plan we liked and got it costed and were all set to move on it, when we saw a property advertised in the paper with 75acres and a 3 bedroom house that looked ok. I did the maths and worked out we were actually going to be paying more to build on 5acres then to buy the farm, so we decided to have a look at it. Expressions of interest had to be in by March 25th, so we got in to look at it on the 24th (my b'day)!! It looked ok, however it was in no way presented for sale!! There was crap everywhere, although we could see enough to know it had pretential and was way better value then building!! The place had actually been on the market for 2yrs, but the owner had dropped the price almost $100,000!! Friday 25th March, Matt went out early to pick up my b'day pressie, SUE!! OMG!! 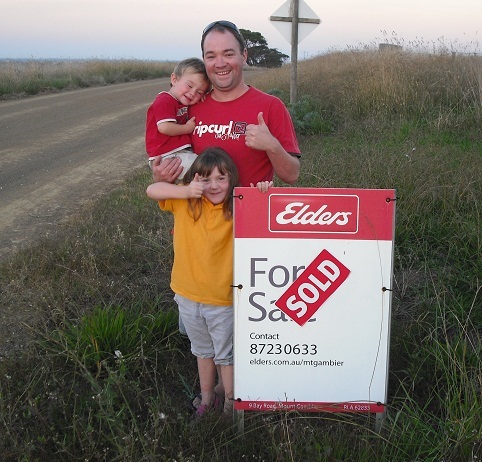 Then Friday arvo we put an offer in for the farm. Friday night we are at the pub for tea and we get a phone call from the agent saying our offer has been accepted, but we aren't to say anything until the owner is home from holidays on Wednesday! OMG!! Late Friday night Shaz arrives (i knew she was coming) and ANTHEA climbs out of her car!! OMG!! Sat we go to Charm's for a scrap arvo, come home to get ready to go out for tea and everybody jumps out of my shed, SURPRISE!! OMG i don't think i can take anymore surprises for the weekend!! Remember i am preggas people, we don't want to be delivering a baby yet!! And the worst part, i really could not tell anybody why i had not clicked that Matt had organised a party. My mind was completely elsewhere!! Now we just have to hope the settlement paperwork can be pushed thru quickly to get it all done before this coming friday when we are meant to settle on the farm!! I have my fingers and toes crossed!! In the mean time, i have started packing, although we will be renting here for a month, while we do some painting and recarpeting and stuff at the new place. Here is the link to the new place if you want to check it out: http://www.eldersrealestate.com.au/listing/listing.php?realist_id=424286 You can see all the crap she has there, and also why we will be painting, lol!! This appearred on the farm a few weeks back too.. So there you have it, i am FINALLY able to share my secret with you all!! And you will all now understand why i have been a little quiet over the past few months, and why i will be even quieter over the next few!! We will be so busy, i really don't know where to start!! lol!! I have started packing up my scrap stuff, cos thats about all i have left to pack, lol, but its hard to know what to leave out, and how much time i will actually have to scrap! I will also have to get my net disconnected and reconnected when we are ready to move too, so i don't know how long i will be off air with that, but i will be able to log on occassionally from my phone! I hope this all makes sense, i realy wanted to get it all up for you all, but am too tired to read back thru and check it all!! lol!! AWESOME!!!! Thats fantastic. The new place looks amazing. Take care of yourself while doing the moving. Fantastic Vicki, looks like a perfect spot. I can't tell you all how excited I was to see that 'SOLD' sign too, as I have been riding the highs & lows of this journey right along with Vicki & Matt. I was lucky enough to go out and see the new property first hand while I was there and WOW! what a spot it is! (Vicki & I immediately started sizing up a potential scrap space for her...LOL) I am so pleased that at last all the pieces FINALLY seem to be falling in place for you guys Vick - CONGRATS!!! Woohoo...exciting stuff! Best wishes for a very smoooooth transition & NO MORE stress, LOL well no more than usual for moving a whole household with kids Congrats to you & the family Vick...the place looks brilliant, love the views. All the best on your move once again and your new house looks FANTASTIC! !